The Japanese Meterological Agency (JMA) reported that a short-lived plume rose to 50 m above Akita-Komaga-take on 14 December 2011 and was recorded by a camera located to the N of Me-dake's summit. Aerial observations were conducted in cooperation with the Japan Ground Self Defense Force on 13 December. Areas of snow melt corresponded to geothermal areas that had been previously identified. No new geothermal areas were found. An M 2.6 earthquake on 27 December at 1234 local time occurred ~2 km W of Me-dake, with a maximum JMA Seismic Intensity of 1 in Senboku-city, Akita Prefecture. The JMA Seismic Intensity scale, used in Japan and Taiwan is classified into 10 categories; 0 to 4, 5 weak, 5 strong, 6 weak, 6 strong, and 7. The seismicity around the area had temporarily increased, but then returned to baseline levels. No volcanic activity related to this seismicity was observed. JMA reported no activity at Akita-Komaga-take in 2012. Information Contacts: Japan Meteorological Agency (JMA), 1-3-4 Otemachi, Chiyoda-ku, Tokyo 100-8122, Japan (URL: http://www.jma.go.jp/jma/en). The Global Volcanism Program has no Weekly Reports available for Akita-Komagatake. "Akita-Komagatake volcano began a new eruption about 1400 TMT, 18 September. Columns of ash (up to 400m high) were emitted along with rumbling of the ground and drumming of explosion. On 19 September, the volcano was still active. Volcanic ashes and bombs were ejected at intervals of five to ten minutes. Explosions took place every 30 minutes. Occurrence of sulphurous acid gas was detected around the spot." Information Contacts: Tokiko Tiba, Dept. of Geology, National Science Museum, Tokyo, Japan. Akita-Komagatake volcano began a new eruption on 18 September 1970 and is still active on 8 October. The first eruption with ash columns, explosion sounds, and incandescent cinders was observed at about 2130 JST on 18 September and a small lava flow appeared. The eruption crater is located at the upper flank of Medake, the central cone of this volcano, where weak fumarolic areas appeared about three weeks ago. This is the first eruption since 1932 (phreatic explosion). The crater is 10-15 m in diameter, and explosion smoke including ash and lava blocks went up about 400 m high at intervals of 4-5 minutes, and a 40-70-m-wide lava flow (andesite: by Drs. Aramaki and Ossaka) reached a length of about 600 m from the crater. These Strombolian-type eruptions take place 400-500 times a day and air-shocks caused by explosions are frequently recorded by an installed seismograph. Seismic observation of this volcano has been in operation by JMA, Tohoku University, and Tokyo University, and petrological, geographical, and other geophysical investigations are [conducted] by many volcanologists. No damage is reported. Information Contacts: Yosihiro Sawada, JMA. Strombolian-type eruptions which began at medake in September are still active on 20 November 1970. The lava flow seems to be continuously supplied and was observed to be about 150 m wide and about 600 m long on 4 November. Eruptions with explosion sounds, cinders (about 500 m high, maximum), and volcanic smoke (about 400 m high, maximum) took place 400-500 times per day in the first part of October. This activity became weak in the latter part of the month and the number of eruptions per day was about 200. The rim of the crater at Medake was covered with new cinders or lava blocks, but no other remarkable change was observed. Explosions at Medake, central cone of this double volcano, began to decrease in number in the middle of October. Explosions took place about 200 times per day with explosions sounds, smoke, and cinders (about 300 m high). But the effusion of new lava did not decline and several new arms of lava flow were formed. Therefore, the lava flow became about 200 m wide and about 600 m long. Volcanic tremors were sometimes recorded by the seismograph installed at a hot-spring spa about 4 km NW of the crater. Strombolian-type volcanic explosions at the summit crater, Medake, have been taking place 100-200 times per day. besides, new lava has been flowing out from the foot of the new cinder cone. Volcanic explosions at Medake crater had been taking place about 200 times per day until the middle of January 1971. Since the 17th, however, the activity declined rapidly and no volcanic explosion has been recorded by the seismograph installed at a point about 4 km NW of the active crater since 25 January. "No eruption has occurred since 25 January this year. It was reported that abnormal phenomena such as explosion sounds, rumbling, etc. were observed in the middle of April, but the information was not confirmed. According to the field observation by the Tazawa-ko Town Office on the 27 April, no active state in and near the crater where volcanic eruptions had taken place until the end of this January was observed, but a weak fumarolic area (about 250 m2) was seen near the crater. Maximum geothermal temperature obtained in this fumarolic area was 80°C. Steaming on the lava flow (about 600 m in length and about 3,600,000 tons in volume) was observed at some places, too.)" Two calderas partially filled by basaltic cones cut the summit of Akita-Komagatake volcano. The larger southern caldera is 1.5 x 3 km wide and has a shallow sloping floor that is drained through a narrow gap cutting the SW caldera rim. On its northern side the southern caldera borders a smaller more circular 1.2-km-wide caldera, whose rim is breached widely to the NE. The two calderas were formed following explosive eruptions at the end of the Pleistocene, between about 13,500 and 11,600 years ago. Two cones, Medake and Kodake, occupy the NE corner of the southern caldera, whose long axis trends NE-SW. The 1637-m-high Komagatake (also known as Onamedake) cone within the northern caldera is highest point, and has produced lava flows to the north and east; it has a 100-m-wide summit crater. Small-scale historical eruptions have occurred from cones and fissure vents inside the southern caldera. The temperatures of geothermal areas increased beginning in 2005, and some fumarolic plumes were observed in 2011-12. Wachi T, Doi N, Koshiya S, 1997. 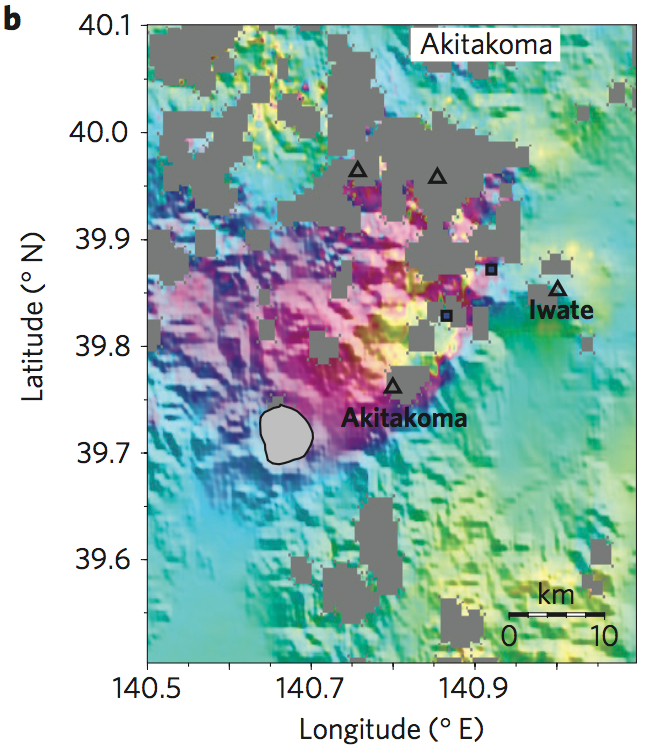 Tephra stratigraphy and eruptive activities of the Akita-Komagatake volcano. Bull Volc Soc Japan (Kazan), 42: 17-34 (in Japanese with English abs). Yagi K, Takeshita H, Oba Y, 1972. Petrological study on the 1970 eruption of Akita-Komagatake volcano, Japan. Hokkaido Univ Fac Sci Jour, 15: 109-138. There is no Emissions History data available for Akita-Komagatake. Omae-dake cone and the small pond Amida-ike are located at the NE end of the summit crater complex of Akita-Komaga-take volcano. The pyroclastic cone Omae-dake (also known as Komaga-take) forms the highest point of the volcano and has produced lava flows to the north and east. This photo is taken from the NE rim of an elliptical 1.5 x 3 km caldera partially filled by basaltic cones. Historical eruptions have occurred from cones and fissure vents inside the caldera. There are no samples for Akita-Komagatake in the Smithsonian's NMNH Department of Mineral Sciences Rock and Ore collection. Large Eruptions of Akita-Komagatake Information about large Quaternary eruptions (VEI >= 4) is cataloged in the Large Magnitude Explosive Volcanic Eruptions (LaMEVE) database of the Volcano Global Risk Identification and Analysis Project (VOGRIPA).